September of this year came. It has become a little bit less hot in the morning and night. This could be a sign of autumn?, maybe influence of typhoon. Since opening of our guesthouse in this January, 8months already went with no real problem. I would like to say thank you to our guests and people support us. As usual, Kyoto in July and August had hot summer. I believe our guests enjoyed activities in Kyoto through a day and knew such hot summer of Kyoto better than me (*^^*). 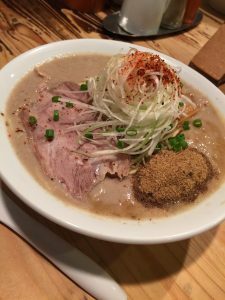 My blog of this time is a part of the series, Ichijoji – Kyoto battleground of Ramen noodles. This is the second article at last, since May. 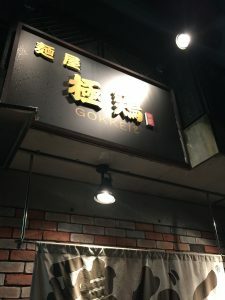 The name of this ramen shop is “Gokkei”, a combination of two Chinese characters 極”Gok” + 鶏”Kei”. “Gok” literally means Ultimate, and “Kei” means Chicken meat. This restaurant is one of the most popular ramen shops in Kyoto making a long queue. Normally, I try to avoid queuing, but I endured a long waiting time (LOL). In our case, it took 2 hours to enter the restaurant. I choose “Tori-daku”. The soup is very thick, no more in the form of a liquid! It is a more paste like, but with full of tasty chicken meat. This is my quite first experience of eating, not drinking the very thick “soup”. I enjoyed a large size of Menma (Bamboo Shoots) too. A lot of shavings of dried fish is added on the thick “soup”, creating a different tasty flavor. 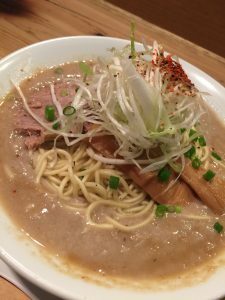 The shop offers 4 kinds of ramen. Others are “Kuro-daku” and “Aka-daku”. I need to find out how taste they are in the next time, maybe different time zone which may have shorter queue.